Yeah, yeah, I know - everyone owns and has read everything by Jan Brett in existance. I'm behind the times and a slow mover. This past Christmas I seriously wondered if I was the only person in the whole entire world who hadn't read a Jan Brett book. Bookstores were FILLED with her winter themed books such as The Three Snow Bears and The Hat . I picked up a copy of The Hat and flipped through it and decided Brett was definitely a fascinating story-teller and illustrator. I decided that I needed to join the craze at some point. My good friend here in town then gifted our family with a copy of Brett's The Night Before Christmas and so, on Christmas Eve itself, I became A Follower and Brett Book Owner. As others have pointed out, Brett's unique style of illustrating a story within the border of the mainstory is quite fantastic. From her website I learned that as a child she used to try to fill up the page she was drawing on and from the looks of it she kept that habit into adulthood. She's a masterful artist. The other week I was browsing our local used bookstore and in their paperback book children's bins I found two Brett books that I had never seen before. I snatched them both up immediately at $2 a piece! 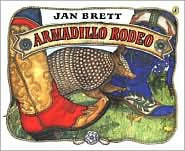 The first book that I found is Armadillo Rodeo and tells the story Bo the Armadillo who lives deep in the heart of Texas hill country. Bo runs into a "red armadillo" (a cowboy boot) that he follows to a rodeo where he views some rough riding and tastes some yummy TX BBQ (which I've talked about before). I briefly considered hanging on to this book but decided that I really need to defer to my sister-in-law and Bookworm1's little cousin who will get far more out of this book than we will. It is TERRIBLY cute but I'm going to ship this copy off to Texas to be enjoyed by my young nephew. 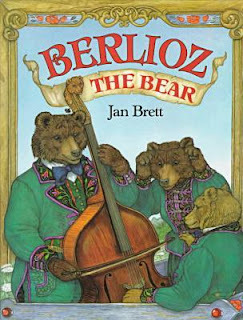 Far more fitting for us, up in Oregon, is the story of Berlioz the Bear . This book plays into our family theme of music (and Jonathan's personal classical music theme). Berlioz plays the double bass in a traveling orchestra. On their way to a performance, their wagon wheel gets stuck in a hole. They spend the rest of the book trying to get their wagon on the road again in order that they might get to their performance in time. Very cute, very fitting and Bookworm1 connected with the instrument right away when we browsed through this book. Brett gives her readers a lot to think and talk about with the way that she uses her ability to illustrate a story. I have to say that I'm a committed fan now and I'm really glad to have found a few books that aren't the regular norm when it comes to Brett. They are awfully fun and I can't wait to see what my sister-in-law has to say about them also! We LOOOOOOVE Jan Brett at our house. I've been able to pick up several of her books through paperbackswap - especially her Christmas/winter ones which we have thoroughly enjoyed. I'm going to be looking for the armadillo now, too! Love Jan's books! Haven't read Berlioz the Bear yet, though. It looks beary wonderful . . . :). I love Jan Brett, too. My girls have been a little frightened of the trolls that appear in many of the Christmas stories, but I plod on and keep re-introducing the stories, anyway. My mom (a former elem. teacher) has given us several Brett books. I can't make up my mind if I like them or not. There's just too much happening on each page for me. I like my illustrations simple, I guess. But my kids enjoy her books a great deal. So we keep reading them.